Sometimes it is congee with side-dishes and other times, it might be steamed rice in place of the rice porridge/congee. Such a meal is quite commonly Asian, or perhaps just typical in my home. We grew up with such meals back in Asia. Today let us have a bowl of rice with side-dishes. 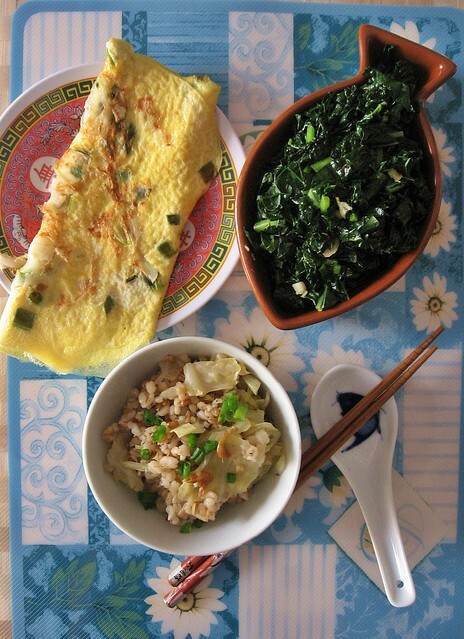 Dried Krill and Cabbage Rice, together with Green Onion, Daikon Omelette and Kale Stir-Fry is a tasty homey meal that can be easily put together.